Our mission is to support parents and caregivers in their child’s academic growth. Five Region Family Engagement Centers are geographically located in the district serving as a hub for workshops and resources. 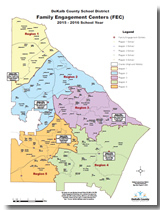 A Region Family Engagement Facilitator is assigned to each location to assist with your parental needs. The centers’ resources focus on instruction, Title I programs, college information, parent engagement and other offerings for students in grades Pre-K – 12th grade. Computers are available for use as well as a lending library allowing parents the opportunity to take resources home, on loan. Parents are encouraged to “Be Our Guest” at any location. This Title I initiative was developed with input from parents and caregivers. Visit the Title I page for more information. All centers are open Monday through Friday 8:30 AM to 5:00 PM. Family Engagement Workshops are conducted throughout the calendar year with varying morning, afternoon and evening time schedules. Centers are also open on certain Saturdays from 9am – 12 noon. Call the individual center for questions. 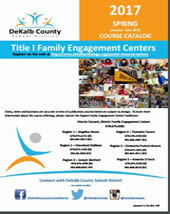 All parents of students who attend a Title I school can take part in the workshops and resources. Topics for the workshops will vary based on a parent needs survey. By building strong parent partnerships, we will increase student achievement in our schools.